The idea is that moving from LCC to XCC, the silicon will contain more cores (sometimes more features), and it becomes cost effective to have three different designs rather than one big one and disable parts to meet the range. The size of the LCC silicon is significantly smaller than the XCC silicon, allowing Intel to extract a better production cost per silicon die. In the enterprise space, Intel has each of the three designs throughout its Xeon processor stack, ranging from four-core parts (usually cut down versions of the LCC silicon) all the way up to 28 core parts (using XCC) for this generation. The enterprise platform has more memory channels, support for error correcting and high-density memory, the ability to communicate to multiple processors, and several other RAS (reliability, accessibility, serviceability) features that are prominent for these markets. These are typically disabled for the prosumer platform. In the past, Intel has only translated the LCC silicon into the prosumer platform. This was driven for a number of reasons. 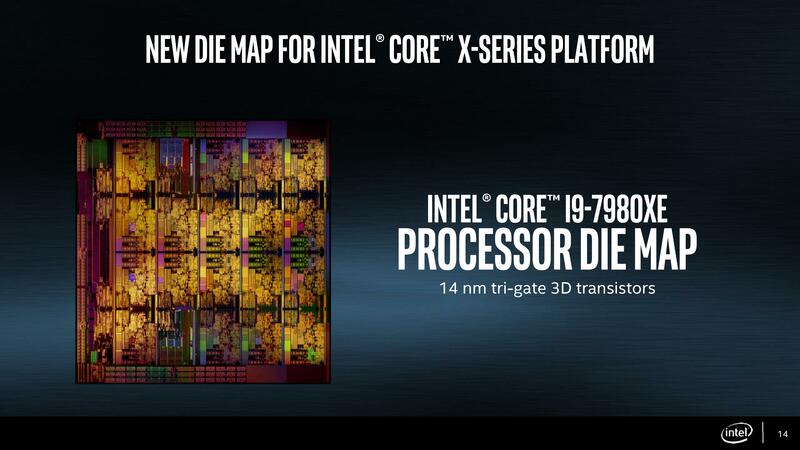 Cost: if users needed XCC, they had to pay the extra and Intel would not lose high-end sales. Software: Enterprise software is highly optimized for the core count, and systems are built especially for the customer. Prosumer software has to work on all platforms, and is typically not so multi-threaded. Performance: Large, multi-core silicon often runs at a low frequency to compensate. This can be suitable for an enterprise environment, but a prosumer environment requires responsiveness and users expect a good interactive experience. Platform Integration: Some large silicon might have additional design rules above and beyond the smaller silicon support, typically with power or features. In order to support this, a prosumer platform would require additional engineering/cost or lose flexibility. So what changed at Intel in order to bring HCC silicon to the HEDT prosumer platform? The short and shrift answer that many point to is AMD. This year AMD launched its own high-end desktop platform, based on its Ryzen Threadripper processors. With their new high performance core, putting up to 16 of them in a processor for $999 was somewhat unexpected, especially with the processor beating Intel’s top prosumer processors in some (not all) of the key industry benchmarks. The cynical might suggest that Intel had to move to the HCC strategy in order to stay at the top, even if their best processor will cost twice that of AMD. Of course, transitioning a processor from the enterprise stack to the prosumer platform is not an overnight process, and many analysts have noted that it is likely that Intel has considered this option for several generations: testing it internally at least and looking at the market to decide when (or if) it is a good time to do so. The same analysts point to Intel’s initial lack of specifications aside from core count when these processors were first announced several months ago: specifications that would have historically been narrowed down at that point in previous designs if they were in the original plans. It is likely that the feasibly of introducing the HCC silicon was already in process, but actually moving that silicon to retail was a late addition to counter a threat to Intel’s top spot. That being said, to say Intel had never considered it would perhaps be a jump too far. Cost: Moving the 18-core part into the $1999 is unprecedented for a consumer processor, so it will be interesting to see what the uptake will be. This does cut into Intel’s professional product line, where the equivalent processor is nearer $3500, but there are enough ‘cuts’ on the prosumer part for Intel to justify the difference: memory channels (4 vs 6), multi-processor support (1 vs 4), and ECC/RDIMM support (no vs yes). What the consumer platform does get in kind is overclocking support, which the enterprise platform does not. Software: Intel introduced its concept of ‘mega-tasking’ with the last generation HEDT platform, designed to encompass users and prosumers that use multiple software packages at once: encoding, streaming, content creation, emulation etc. Its argument now is that even if software cannot fully scale beyond a few cores, a user can either run multiple instances or several different software packages simultaneously without any slow-down. So the solution to this is rather a redefinition of the problem rather than anything else, which could have applied previously as well. Performance: Unlike enterprise processors, Intel is pushing the frequency on the new HCC parts for consumers. This translates into a slightly lower base frequency but a much higher turbo frequency, along with support for Turbo Max. In essence, software that requires responsiveness can still take advantage of the high frequency turbo modes, as long as the software is running solo. The disadvantage is going to be in power consumption, which is a topic later in the review. Platform Integration: Intel ‘solved’ this by creating one consumer platform suitable for nine processors with three different designs (Kaby Lake-X, Skylake-X LCC and Skylake-X HCC). Both the Kaby Lake-X and Skylake-X parts have different power delivery methods, support different numbers of memory channels, and different numbers of PCIe lanes / IO. When this was first announced, there was substantial commentary that this was making the platform overly complex, and would lead to confusion (it lead to at least one broken processor in our testing). Each of these areas has either been marked as solved, or redefined out of being issue (even if a user agrees with the redefinition or not).